In May 2014 the German publishing house C.H. 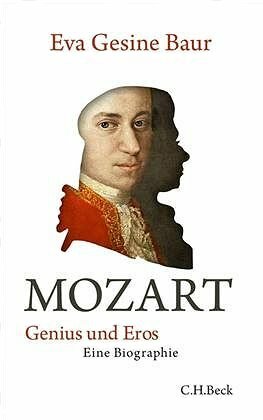 Beck published Eva Gesine Baur's new Mozart biography Mozart Genius und Eros. Although I have recently been commissioned to review this book for a German music journal, I have to address this publication already on my blog, because it is endlessly fascinating as far as the problems in current Mozart literature are concerned. Baur has learned a lesson from her flawed Schikaneder book and has delved deeply into the Mozart literature. And yet it is not enough. In many cases Baur's accumulated knowledge turns out to be almost worthless, because she is not in a position to evaluate the significance and quality of her secondary sources. She has sucked up huge amounts of information and throws good and bad material together. Her book is proof that knowledge cannot be acquired through reading alone and the topic of Mozart's life is a field where the validity of this paradigm becomes especially apparent. Baur's problem is the problem of most recent publications dealing with Mozart's biography: to write a really good book about the composer, one would have to devote at least ten years into research and these studies should of course not be limited to Mozart. Since such a long preparation is financially not viable, this book is not being written. And the Mozart scholars who do research in the archives – because they are only interested in exploring the unknown – have no interest (and no means) to write such a book. Exhausted from the strains of a trip in bad weather, with miserable food and disgusting lodgings, right after their arrival on Holy Thursday Wolfgang is being dragged[sic] to the Sistine Chapel by his father. There he must[sic] listen to Gregorio Allegri's Miserere. An a capella setting of the 50th Psalm which is allowed to be performed only by the Papal Chapel. The singers are strictly forbidden to take the music outside the chapel and copy it. It is said that any violation of this rule is punished by excommunication. This is what makes this insignificant[sic] piece interesting and provokes Leopold to stage a coup. After having listened to the Miserere twice, his son presents a full score of the piece, a proof of his learnedness. People in the Vatican are impressed. It is of course very funny to visualize Leopold Mozart, dragging his son against his will to the Sistine Chapel (with Mozart exclaiming: "Herr Papa, bitte nicht in die Kapelle!"). But what kind of strange mindset could make an author of a Mozart book come up with such a scenario? Instead of passing embarrassing judgement ("belangloses Stück") on a musical masterpiece, an author who actually loves her topic and has delved deeply enough into the matter, could address the fact that by 1770 three unembellished versions of Allegri's Miserere had already become accessible to the public. Following the footsteps of Neal Zaslaw, this author could raise the question as to how extraordinary Mozart's musical feat actually was (owing to long plainsong passages it is overrated). She could avoid the mistake of claiming that the Mozarts' first visit to the Sistine Chapel took place on Holy Thursday, because it already took place one day earlier, on Wednesday, April 11th, 1770. She could refer to the memoirs of the poet (and accomplished musician) Franz Grillparzer, who on 8 April 1819 also visited the Sistine Chapel, attended a performance of the Miserere and described this heavenly experience as follows: "The wonderful Miserere by Allegri, performed by the most glorious voices, where with theatrical artistry everybody waits for the moment when the Sistine Chapel with Michelangelo's masterpieces is plunged into darkness, and now, from the solely lighted choir, the music begins, as if sent from heaven." And finally, she could avoid the nonsensical claim that Leopold Mozart showed the score around to impress people inside the Vatican ("Im Vatikan ist man beeindruckt."). This is exactly what Leopold Mozart did not do! [Freystädtlers] "unbestimmter Urlaub" von Salzburg muß schon 1782 begonnen, und sein Aufenthalt in München vier Jahre gedauert haben. Das Gespräch zwischen Freystädtler und Mozart anläßlich der Salzburger Aufführung der c-moll-Messe 1783, das sich Hamann ausmalt, hat ebensowenig stattgefunden wie Freystädtlers Mitwirkung als Organist bei der Aufführung dieser Messe. Freystädtler's "unspecified vacation" from Salzburg must already have begun in 1782 and his stay in Munich must have lasted four years. The conversation between Freystädtler and Mozart, on the occasion of the performance of the c minor mass in 1783 in Salzburg that Hamann imagines, never took place and neither did Freystädtler take part as organist in the performance of this mass. What Baur mistook for my text in footnote 28 of my article, is actually a quotation (in quotation marks!) from a mistaken presumption that Heinz Wolfgang Hamann in 1962 put foward in an article. This is only one of several examples of Baur's misunderstanding the literature. But the best of all her efforts to acquire knowledge (which basically are quite laudable) is the one instance where she actually decided to do some archival research of her own and look at a document from a Vienna archive. In a review of Günther G. Bauer's book Mozart. Geld, Ruhm und Ehre, which I published on the Web in 2012, I addressed the fact that Bauer could only estimate the annual income of Mozart's fellow Freemason and one-time creditor Franz Hofdemel, because Bauer's prominent collaborators were prsumably unwilling to push forward into this area of archival research. Hofdemel has acquired a certain notoriety, because in 1789 he lent Mozart money and his wife allegedly took piano lessons from Mozart. On 6 December 1791, in a fit of insanity, Hofdemel attacked his pregnant wife with a razor blade and then committed suicide, an incident which lead to all kinds of completely unfounded speculations concerning a possible love affair between Mozart and Hofdemel's wife. In my review of Bauer's book I wrote: "Das Einkommen Franz Hofdemels als Kanzlist der Obersten Justizstelle, das Bauer nur schätzen kann, ist natürlich Hofdemels Sperrs-Relation (WStLA, Mag. ZG, A2, 3730/1791) zu entnehmen, doch Bauers »wissenschaftliche Mitarbeiter« wollten offensichtlich in diese archivalischen Gründe nicht vordringen." Eva Gesine Baur jumped at the shelfmark of Hofdemel's probate records that I had published (quite superfluously) in my review, because she obviously hoped to shed some light on the question whether Hofdemel's wife had really been Mozart's piano pupil. Baur decided to do archival research. She ordered scans of Hofdemel's Sperrs-Relation from the Municipal and Provincial Archives of Vienna and used the document for her book which is proved by her proudly referring three times to its shelfmark in her footnotes. What was designed greatly to impress her readers, however, led to an amusingly embarrassing episode which could serve as a valuable lesson for future amateur researchers. Auch musikalisch scheint er gewesen zu sein, denn in seinem Nachlaß fanden sich zwei Geigen, ein Bassethorn[sic] und Musikalien im Werte von 92 fl. 42 kr. Verheiratet war er überdies mit der Tochter eines Brünner Kapellmeisters, mit Magdalena, geb. Pokorny. Ihr erteilte nun Mozart Musikunterricht. Vielleicht sollte damit ein Teil der Schulden abgezahlt werden. Nach der Verlassenschaftsabhandlung ist aber kein Klavier vorhanden gewesen, in was soll also Mozart der Hofdemel Musikunterricht gegeben haben? Geige ist wohl für eine Frau ungewöhnlich, bliebe also nur der Gesang. He [Hofdemel] seems to have been musical as well, for in his estate, two violins, a basset horn and music, estimated ​​at 92 gulden 42 kreuzer were found. He was married to the daughter of a capellmeister from Brno, Magdalena, née Pokorny. It was her who received music lessons from Mozart which were probably supposed to pay off part of the debt. But no piano is listed in the probate records, in what should Mozart therefore have given music lessons to Mrs. Hofdemel? Violin is probably unusual for a woman, that would only leave singing lessons. Contrary to Baur's claim, the godfather did not "bear all the forenames under which Magdalena's child was entered into the baptismal register". The names of the godfather were not "Johann Nepomuk Alexander Franz", but "Alexander Fidelis". And the existence of the godmother completely escaped the attention of Dr. Baur whose inflated expertise suddenly shrinks when measured with the primary sources. The child Johann Nepumuk Hofdemel already died on 13 May 1794 of "Kartharfieber" (Moravský zemský archiv Brno, Brno sv. Petr a Pavel [na dómě] 16959, p. 163). After the boy's death his share of the modest paternal inheritance of 1,350 fl 4 1/2 x was divided between his mother and sister (A-Wsa, Mag. ZG, A2 3294/1794). What about the piano that "is not listed in Hofdemel's probate records"? Hofdemel's Sperrs-Relation contains five different lists of assets: 1) The "Inventur und Schätzung" of all of Hofdemel's belongings, 2) the Catalogus Librorum Hofdemlianorum (the catalog of Hofdemel's books) in two parts, because of 171 books only 73 were sold at an auction, 3) the "Schätzungs und Lizitationsausweisung" (the results of the auction of Hofdemel's belongings), 4) the "Ausweisung uiber die eingehandelten 6 öffentlichen Fonds Obligationen" (the result of the sale of Hofdemel's public bonds), and 6) the so-called "Theillibell", the exact distribution of Hofdemel's net assets among his two children (a balance that proves that the value of Hofdemel's estate given by Gugitz is completely false). The first list, drawn up by the Sperrskommissär Lovin on 11 January 1792, contains an item that proves Baur's reasoning utterly wrong. There it is: Magdalena Hofdemel's piano which (according to Baur) "is not listed in her husband's probate records" which (according to Baur) proves that "generations fell into a trap by erroneously believing that she was Mozart's piano pupil". The existence of the piano, of course, does not prove that Hofdemel's wife was Mozart's pupil. Some authors (like Baur, who erroneously claims that Magdalena von Kurzböck was a pupil of Mozart's) seem unable to accept that there were actually female pianists in Mozart's time who were acquainted with the composer without taking lessons from him. Especially amusing is the fact that Baur (like Gugitz) still thinks that a "Passetl" is a basset horn, although I have explained the meaning of this word in a review that is listed in Baur's bibliography. But as I said above: knowledge cannot be acquired by reading. To round off her fantasies, Baur offers yet another explanation for Hofdemel's suicide (p. 521): "Möglicherweise war Hofdemels Problem Folge von Alkoholmissbrauch. In seinem Nachlass finden sich beachtliche Vorräte." ("Hofdemel's problem may have been the result of alcohol abuse. Considerable supplies can be found in his estate.") It comes as no surprise that these huge amounts of wine do not appear in Hofdemel's Sperrs-Relation. It would surely be fascinating to figure out the origin of Baur's error, but in this case I shall follow Goethe's advice that inscrutable mysteries should rather be revered than explained. There are of course still some unanswered questions concerning Franz Hofdemel, but who his wife's piano teacher was is really not the most pressing among them. Where was Hofdemel born? Where and when did he and Magdalena Pokorny (b. 27 June 1766 in Brno) get married? Although his wedding is not registered in the records of the Brno Cathedral, this issue could easily be cleared up with an internet access and the necessary amount of diligence. Baur's musings concerning the possible date of birth of Hofdemel's daughter Theresia (p. 499) are moot, because in the age of the World Wide Web it takes less than five minutes to figure out that this child was born on 6 January 1791. Up-to-date research methods seem difficult to master for an author who – as far as basic research is concerned – let herself become too distracted by the protagonists of Socrates's speech at Platon's Symposium. How are the two different dates of Hofdemel's death in the records to be explained? The Totenbeschauprotokoll has 6 December, and yet 10 December 1791 is given on his Sperrs-Relation and in the Wiener Zeitung. "10 Xb: 791" given as Hofdemel's date of death in his Sperrs-Relation. This date is referred to as factual in the whole file. The autopsy, which was conducted at the Allgemeines Krankenhaus, took some time, but this does not explain a discrepancy of four days. The entry in the death records was copied from the surgeon's note which proves that the autopsy had already been done. The confusion is not reduced by the entry in the records of Vienna's General Hospital concerning Hofdemel's burial which gives December 7th as his date of death and December 9th as the date of his burial. In this entry Hofdemel is referred to as "Hofdümel N. gew. Kanzelist bey der Oberst Justitz Stelle" with the cause of death given as "sich selbst ermordet". Hofdemel was buried in the "Gottesacker ausser der Währinger Linie" (i.e. the Währinger Allgemeiner Friedhof). The "Rohlederisches Haus", Stadt 1360 (built in 1784, today Grünangergasse 10), where in 1791 Franz Hofdemel committed suicide. The owner of the house, Friedrich Wilhelm Rohleder, was the retired manager of the Theresianum and a close friend of the writer Maria Anna Sager and her husband. In this house Grillparzer's father died in 1809. The information concerning the size of the concert hall in the Trattnerhof on p. 218 was copied from my 2013 blogpost Mozart in the Trattnerhof without providing a source. The information concerning the Trattnerhof on p. 395 was also copied from my 2013 blogpost Mozart in the Trattnerhof which is not referred to in the bibliography on p. 394 or in a footnote. The shelfmark of the 1788 tax register as source for Mozart's rent in the Camesina-Haus is taken from my 2009 article Mozart's Apartment on the Alsergrund. By giving a shelfmark in brackets in the text Baur is dishonestly pretending to have personally consulted this archival source. The information as to how the chapel in the Trattnerhof was converted into a hall (p. 456, fn 5) is lifted unsourced from my 2013 blogpost Mozart in the Trattnerhof. The explanation of Barbara Ployer's family relation to Gottfried Ignaz von Ployer (p. 460, fn 17) is taken from my article "Gottfried Ignaz von Ployers Haus in Döbling. Eine vergessene Mozartstätte", Acta Mozartiana 47, vol. 1-2, (June 2000), which is not given as source. The smart-aleck comment on Helmut Kretschmer's wrong date of Cavalieri's date of birth with the reference to Pisarowitz (p. 468, fn 7) is lifted from my review of Melanie Unseld's book Mozarts Frauen. Begegnungen in Musik und Liebe which was published in the Mozart-Jahrbuch 2007/08. The embarrassing fact of course being that Baur does not know that Kretschmer copied the wrong date from the commentary in Gugitz's 1924 edition of Da Ponte's memoirs (a book that is listed in Baur's bibliography). The explanatory comment on the Deiner issue (p. 475, fn 3) with the information on the "former fruit dealer" Josef Preisinger is lifted from my 2012 review of Günther Bauer's book. The information concerning the different value of the Gulden in Salzburg and Vienna (p. 481, fn 33) is also taken without reference from my review of Günther Bauer's book. That my name appears in the following sentence in connection with another issue cannot hide the fact that Baur is presenting my knowledge as her own. The source for Mozart's lowest possible rental expense of 300 gulden in the house Stadt 245 in 1789 (p. 493, fn 4) is not Brauneis's 2013 article "Mozart: In und vor der Stadt", but my 2009 article Mozart's Apartment on the Alsergrund from which Brauneis plagiarized this information. The explanatory note concerning the two Closset brothers (p. 500, fn 45) is based on research that was published in my review Das Forschungsprojekt "W. A. Mozart und sein Wiener Umfeld". Again Baur is proudly waving a lamp that I have lighted a long time ago. Ignaz von Seyfried's five forenames (p. 508, fn 5) are copied from my review of Günther Bauer's book. Baur does not feel embarrassed by showing off with the results of my research in the 1776 baptismal records of St. Stephen's Cathedral. Baur's knowledge that "there is no proof that on 4 March 1791 Mozart performed the concerto K. 595" (p. 508, fn 6) is lifted from the same review. The information concerning "the notes of Aloys Fuchs" which give an amount of 100 ducats as Mozart's fee for Die Zauberflöte (p. 511, fn 14) is also lifted from my review. Baur could never name the exact source for "the notes of Aloys Fuchs". The information that beginning in November 1790 Franz Xaver Süßmayr was working as substitute at the Burgtheater and was paid 26 fl for "extra service", a job that he probably got with the help of Salieri (p. 513, fn 29), is taken from my article "Süßmayr und die Lichterputzer: von gefundenen und erfundenen Quellen", in the Mozart-Jahrbuch 2006, (Kassel: Bärenreiter, 2008), pp. 425-38. Baur does not provide a source and thus dishonestly presents my research as her own. That Joseph Bonno (whom Baur mistakenly calls "Giuseppe") like Mozart was buried for 8 fl 56 x, although he had died without debts (p. 523, fn 66), is lifted from my review of Günther Bauer's book. The information that in the late eighteenth century 99% of the Vienna populace received third-class burials is also copied from this review without providing a source. Baur's book never underwent a thorough proofreading process which gives rise to the assumption that her publisher already laid off the entire editorial staff some time ago. A simple spell check could have avoided mistakes such as "Portät", "Solo-Sopran-Partieen" and "Hauseinsegung". According to Baur, Mozart's Der Schauspieldirektor was premiered on "7 February 1886", the clarinetist Anton Stadler was born "in 1793" and Babette von Natorp's biographical dates are "1769-1744“. We encounter flawed German phrases such as "um den 25. September 1764 herum", "Zu der Frau von Mesmers Stiefsohn", "Mozart schreckt auf" and three musicologists with botched names make an amusing appearance: "Karl Pfannhaus", "Daniel Ende" and "Hermann Albert". These are just the bloopers caused by sloppiness and lack of decent editing. Keep in mind that I have not even touched the vast number of factual mistakes that appear on almost every page of this abysmally weak book. Ernst Hilmar, a musicologist of dubious reputation, but undeniable scholarly merits, once said to me (responding to my critical remarks about his shallow printed output): "Kritisieren ist leicht. Wann werden Sie einmal etwas vorlegen?" ("Criticizing is easy. When will you present something?" – the term "something" of course referring to a book). This points right at the core of my unpopular point of view: I do not want to "present something". As a matter of fact, I also do not want to see others "present something". I am strictly against the continuous publication of thick, but flawed books that sycophant journalists describe as "meticulously researched" and admirers of the author call "One of the best books about Mozart ever written".